The Arc of Stanly County, Inc. was founded in 1958 by a small group of parents and other concerned individuals. At that time, little was known about the condition of intellectual and developmental disabilities (I/DD) or its causes, and there were virtually no programs and activities in communities to assist in the development and care of children and adults with mental retardation and to help support families. In the early days the association worked to change the public’s perception of children with intellectual and developmental disabilities and to educate parents and others regarding the potential of people with I/DD. The Arc also worked to procure services for children and adults who were denied day care, preschool, education and vocational supports. Today, we provide an array of services and supports across North Carolina for people with intellectual and developmental disabilities, mental illness and substance use disorders. Review our agency timeline to see our growth over the years. Monarch believes that every person deserves a valued life as defined by that person. Our past growth demonstrates that we are a preferred provider for many North Carolinians. We anticipate that we will continue to grow as demand for our supports and services increases. Review our current projects. Arc of Stanly was founded by a small group of parents. Wiscassett donated cash and land to build Greenwood Center Daycare. Fourth Street Apartments open. First Arc-HDS Group Home built in NC. Stanly County Vocational Workshop, Greenwood Center and Chivington House, consolidated into Arc Services. The Arc of Stanly remained as the parent company and advocacy arm. Arc Services opened Anderson Road Group Home, first Medicaid waiver group home in NC. Opened Prader-Willi Group Home, first in NC, and developed Children’s ICF/MR Group Home. New programs: Community CAP and Respite. Awarded grant from HUD to develop second Prader-Willi Group Home. Established micro-enterprises owned and operated by consumers. Terry’s Greenhouse opens. Four other DBA’s established. Awarded homes, apartment complexes and vocational centers from Rutherford-Polk Area Authority, Piedmont Area Authority, Centerpoint Human Services, and Community Based Alternatives, Inc. extending to15-county service area. Awarded contracts in Sandhills Local Management Entity, Pitt County Local Management Entity, and Neuse Local Management Entity. Foundations Behavioral Health Center opened with two therapists. Services provided in 30 counties. Assumed services for Piedmont Behavioral Health (PBH). Foundations expanded to Rowan and Davidson counties. Foundations provided Intensive In-Home services to families, added psychiatrist, and began using telemedicine. Opened first Mental Health Supported Living Low Group Home in the PBH catchment area. Added four vocational sites in the Southeastern Regional Catchment Area, Bladen, Scotland, Robeson, and Columbus. Arc Services changes its name to Monarch. Foundations and all other services under one name. Opened a home dedicated to moving people out of psychiatric institutions. Launched Monarch across North Carolina starting the Dream Revolution. Accepted management of three group homes in the Hendersonville area. Opened the first two community-based homes in NC for people coming out of the psychiatric hospital with high needs. Accepted management of five day support programs in Chowan, Dare, Tyrrell, Pasquotank, and Currituck counties. “Beach Club” opened in Dare County. Acquired Pinetree Community Services in Moore, Hoke, Richmond, Anson, Lee, Montgomery, and Cumberland counties. Monarch became a Critical Access Behavioral Health Agency (CABHA). Selected by Mecklenburg County officials to take over housing and other mental health services previously served by Mecklenburg Open Door. Added Assertive Community Treatment Teams (ACTT) formerly operated by MHA. In January, accepted management of school based Day Treatment Program in Union County. In May, Monarch was awarded a mobile crisis team, facility based crisis, and walk in clinic including psychiatric medication management services, injection clinic, and crisis assessment services in the Southeastern Regional MH/DD/SAS region. This includes Bladen, Columbus, Robeson, and Scotland counties. In April, at the request of the Arc of North Carolina and the Arc of High Point, Monarch entered into a management agreement with the Arc of High Point. This agreement is for Monarch to be responsible for the day to day service delivery to the people supported by the Arc of High Point. It includes all aspects of running the organization which encompasses residential, day and VR services. Monarch is also responsible for the QA monitoring and financial oversight of the agency. On April 15, Monarch hosted its third annual “Dreams Take Flight” golf tournament at beautiful Tillery Tradition Country Club in Mt. Gilead, N.C. The event raised more than $40,000 in much needed funds for Monarch programs to directly support people who are living with intellectual and developmental disabilities, mental illness, and substance abuse issues in more than 55 counties throughout North Carolina. This year’s event had special importance as recent state budget cuts have endangered Monarch programs. Proceeds raised will help people who may be a victim of federal and state budget cuts and may be in jeopardy of losing critical services. Despite economic challenges, the business community stepped up making this the most successful tournament to date. In January, Monarch announced that Companions on the Journey (COJ) joined the agency effective Jan. 1, 2012. The new program name will be Monarch’s Companions on the Journey and supports adults with intellectual and developmental disabilities from Guilford, Forsyth and Randolph Counties. Since 2006, the people supported have served their community through countless volunteer hours and have received recognition for their service from the Knights of Columbus and Muscular Dystrophy Association. On Feb. 1, the Monarch Creative Arts and Community Center (MCACC) in Southern Pines opened. The MCACC provides a new venue for Monarch’s day program, which supports people with intellectual and developmental disabilities and offers various activities and services. The space includes a pottery studio and kiln, art and dance studios, fitness space, full kitchen and a conference and meeting room. The center also contains a gift shop which is open to the public. A public ribbon-cutting ceremony was held in June 2013 and approximately 100 people supported, family members, staff and community residents and leaders attended the event. Also in February, Monarch announced the expansion of services in Guilford County where they became a major provider of behavioral health services, including outpatient, crisis/emergency and medication management as well as emergent referrals to mobile crisis, facility-based crisis, and non-hospital detox services. Monarch acquired services from the Guilford Center and will continue to operate in the county-owned Bellemeade Center. This allows Monarch to fulfill its mission to offer more quality programs, expand services continuum and provide more access to care to the people supported. On April 20, Monarch hosted its Fourth Annual Dreams Take Flight Golf Tournament, with a sellout crowd, at Tillery Tradition Golf Club in Mt. Gilead. The fundraiser raised approximately $45,000 to benefit the programs and services Monarch provides to support people with intellectual and developmental disabilities, mental illness and substance abuse challenges. The North Carolina Department of Health and Human Services granted Monarch a license to become a Facility-Based Crisis Center. In October, Monarch expands its mental health services to Nash and Wilson counties. Monarch was chosen by Eastpointe to assume services from ResCare, Inc. With this expansion, the agency begins to offer an extraordinary new mental health service – Open Access, which helps to eliminate long wait times for people who need psychiatric assessment and medication. Open Access allows individuals who need services to simply walk-in for the first visit. The goal is to jump start the road to recovery by providing triage services, a comprehensive clinical assessment, a treatment plan, a psychiatric evaluation with prescriptions if needed and a referral to the proper level of care. While the process takes longer than a traditional appointment, it reduces what could otherwise be months of waiting. The agency offers this service in all of its existing and any new behavioral health offices. In April, Monarch expanded to become a major provider of outpatient behavioral health services in Columbus, Robeson and Scotland counties effective April 15. In May, the agency was awarded a Request for Proposals (RFP) by Wake County to manage the county’s current adult outpatient services. This will add five new Monarch outpatient sites in Wake County that will be located in Cary, Fuquay Varina, Raleigh, Wake Forest and Zebulon and these newly acquired services began on May 15. During the month of August, Monarch again expanded its services to manage and operate several existing group homes in Johnston County. On Oct. 4, Partners Behavioral Health Management (BHM) the managed care organization overseeing Medicaid, state and local funded behavioral healthcare for eight counties in North Carolina announced Monarch would deliver behavioral health services to approximately 400 individuals who previously contracted to True Behavioral Healthcare of Gastonia. Partners BHM immediately initiated a selection process to identify other organizations that could deliver these services and selected Monarch. True Behavioral operated a number of mental health, substance abuse and intellectual disability services including clinics in Gastonia, Lincolnton and Shelby. Monarch assumed these services and began operating on Oct. 7. Monarch partners with Mental Health First Aid (MHFA) USA to bring an incredible community service to people in our area. MHFA reduces stigma and increases the understanding that mental illness is real, common and treatable. MHFA gives participants an overview of substance use disorders and mental illness such as depression, anxiety, trauma, psychosis, eating disorders and self-injury. They will also be introduced to the risk factors and warning signs of these illnesses. Participants will be able to connect individuals demonstrating or exhibiting these signs with appropriate professional care and resources. Monarch will first offer MHFA training to administrators in Stanly County Schools and have plans to extend to a broader audience in January 2014. In November, Monarch plans to embark upon a brand awareness campaign to further position its mission and services throughout the Piedmont. The agency is contracting with a Matthews, NC-based firm Big Idea Group to help develop concepts that best describe and leverage the agency’s services through a variety of print, broadcast and Internet-based mediums. The agency has plans to start in the Charlotte market (the Piedmont) which covers 14-16 counties, with possible expansion in the future to other counties where the agency provides services. In June, Monarch was named the 2014 Moving Mountains Best Practices Award recipient by the National Alliance for Direct Support Professionals (NADSP) and the Research and Training Center at the University of Minnesota’s Institute on Community Integration. NADSP, an organization working to enhance the status of direct support professionals, recognizes organizations, like Monarch, that use best practices in direct support staff workforce development. Those practices result in improved outcomes for the people with disabilities who are supported. Monarch was selected from among numerous award candidates for its Helping Dreams Take Flight initiative, which includes a partnership of agencies joined to create a training and certification program for direct support professionals to enhance their skills and increase the quality of care provided to the people they support. Monarch CEO Dr. Peggy Terhune accepted the award on behalf of the agency during the 2014 Reinventing Quality Conference in Baltimore, Md. in early August. In August, Monarch officials recently announced an expansion of mental health services into Forsyth County. Monarch began managing services formerly provided by People Helping People (PHP) of North Carolina, LLC. CenterPoint Human Services, the managed care organization that oversees the delivery of Medicaid and state-funded programs through a network of providers supported the Monarch expansion of services, which includes Open Access. Monarch’s new Forsyth office is located at 4140 N. Cherry Street, Winston-Salem. Several weeks later, the agency acquired NuDay Case Management. The merger of these services included guardianship, which is a new service added to Monarch’s array and an ADHD specialist. On Oct. 31, Club Horizon, a Psychosocial Rehabilitation (PSR), joined Monarch’s current service offerings in the Raleigh area. The program will keep its name, simply adding Monarch to the moniker to become Monarch’s Club Horizon. It will continue to provide a community-oriented and restorative environment for persons living with and in recovery from severe and persistent mental illness. Monarch’s Club Horizon, located in Knightdale, is one of only seven of the Clubhouse International accredited programs in North Carolina. Monarch currently operates five PSRs located throughout the state. In the fall, Monarch was awarded a RFP in Wake County to expand an evidence-based practiced called Dialectical Behavior Therapy (DBT). On Dec. 4, Monarch was recognized for its Open Access service with the 2014 Excellence in Best Practice Services Award from the North Carolina Council of Community Mental Health, Developmental Disabilities, and Substance Abuse Programs. Monarch CEO Dr. Peggy Terhune accepted the honor on behalf of the organization. The award was presented during the N.C. Council’s Annual Conference and Exhibition in Pinehurst. Alliance Behavioral Healthcare nominated Monarch for the recognition. Monarch was among seven award recipients in varying categories. Monarch is one of four providers (Alexander Youth Network, Phoenix Counseling Center and Support Incorporated) collaborating to offer behavioral health services at the newly created Lincoln Wellness Center, 311 McBee St., Lincolnton. Managed by Partners Behavioral Health Management (MCO), the location was established to offer a continuum of mental health services for residents of Lincoln County. A community open house and ribbon-cutting ceremony was held at the center on Dec. 18. In January, Monarch was awarded three Facility Based Crisis (FBC)/Behavioral Health Urgent Care expansion contracts from MCOs managing services in Winston-Salem, Lumberton, and Charlotte. The N.C. Division of Mental Health, Developmental Disabilities, and Substance Abuse Services awarded three of four statewide grants to our MCO partners and Monarch to help transform the crisis system throughout the state. Monarch’s Tanglewood Arbor location will transition into a Tier 4 Behavioral Health Urgent Care Center and Involuntary Commitment (IVC) ready Facility Based Crisis program, which will expand and open after renovations in Spring 2016. The second of the four grants will be used to help build a 16-bed Facility Based Crisis Center and 12-bed BH Urgent Care Center in Winston-Salem, with a projected opening in 2016. The third award will be used to build the first ever Child and Adolescent facility based crisis program in Charlotte, which will open in fall 2016. All three projects will provide more complex care for individuals in crisis, ultimately diverting them away from the emergency department, which was a central goal of the NC DHHS grant project. On Jan. 31, Monarch’s behavioral health marked 10 years of providing mental health services. The organization started in Stanly County with two therapists and served the first person, a child, during the first two weeks of opening as Foundations Behavioral Services. In 2014, Monarch supported 23,000 people in 18 offices statewide. In August, Monarch relocated its Forsyth Industrial Systems at 650 North Highland Avenue in Winston-Salem. The program, which has been housed on North Highland Avenue for decades and provided a large site for production work, also offered a day program, employment and community services for people with intellectual and developmental disabilities. To help the program become more community oriented, the site that once housed several programs under one roof, now has three separate locations in Forsyth County. For more than a year a steering committee, comprised of people we support, families, community partners, CenterPoint Human Services representatives and Monarch staff, held meetings to solicit input from families, caregivers and partners to determine appropriate programming and decided several sites would help to more easily foster community engagement for the people who participate in the program. In August, Monarch achieved Person-Centered Excellence Accreditation with Distinction from the Council on Quality and Leadership (CQL), demonstrating its adherence to high industry standards and performance measures for continual growth. It is only the fifth company worldwide to achieve this level of accreditation. Representatives from CQL visited Monarch locations across North Carolina, conducting one-on-one interviews with people supported; focus groups with people receiving services, staff and community members; a stakeholder-led agency evaluation; and reviews of written support of the agency’s practices. CQL accreditation promotes excellence in person-centered services and supports that lead to increased quality of life and continued organizational improvement. Providers are evaluated on their accountability and effectiveness in health, safety and human security, as well as best practices and quality of life outcomes for the people supported. In April, Monarch hosted a ceremony and broke ground on a 11,654-square ft. medical office building Child & Adolescent Facility-Based Crisis (FBC) Center in Charlotte’s University Area, near Harris Boulevard. This FBC will be the first step in life-changing care and treatment for families and children ages 6 to 17 who face a mental health crisis in Mecklenburg County. The Center will provide access to timely, age-appropriate mental health care during a time of crisis. This 16-bed facility will embrace all Mecklenburg County children and adolescents in need — Medicaid-eligible, uninsured, underinsured, and private pay. The building is projected to be completed in time for a third quarter move-in. In May, Monarch was selected as the partnering non-profit and will begin offering all support services to enrolled students in Beyond Academics program at The University of North Carolina at Greensboro (UNCG) beginning July 1, 2017. Over the last 10 years, Monarch has offered post-graduation support services for students who graduate from the Beyond Academics Comprehensive Transition Program. Beyond Academics was the first post-secondary program for students with I/DD in North Carolina, with its inaugural class graduating in 2007. Monarch’s support services offered to students that are enrolled in the Integrative Community Studies (ICS) program are specifically designed for students with I/DD to maintain or enhance their ability to live independently while living on a college campus or in their desired community during their college experience. There are currently 60 enrolled in the 2017-2018 academic year. On Aug. 28, approximately 50 community members, elected officials, representatives from the hospital, social services, school system, and Eastpointe, the region’s managed care organization (MCO), gathered at Monarch’s Facility-Based Crisis (FBC) center in Lumberton for a grand reopening ceremony. The facility was recently renovated and expanded from 11 beds to 16. The renovated crisis program provides in-patient treatment options for adults who are experiencing a mental health crisis or need non-hospital substance use and detoxification services requiring 24-hour secure and medically supervised care. Monarch received more than $2 million in support from Eastpointe and federal and state funding streams. The Cannon Foundation also contributed to the renovation and expansion of the FBC center. In early September, Monarch announced an expansion of long term services in Cabarrus, Rowan and Gaston County. The organization began managing services formerly provided by Community Living Concepts on Sept. 1. The supervised living and community network locations affected by this acquistion are home to 19 residents with Intellectual and Developmental Disabilities (I/DD) and approximately 40 staff. The group homes will keep their names and simply add Monarch to the moniker. Monarch’s leadership team also is working to ensure that people who receive services will not experience a disruption of those services. On Oct. 24, Monarch earned The Joint Commission Gold Seal of Approval® by demonstrating continuous compliance with the Commission’s performance standards. Monarch voluntarily underwent The Joint Commission’s thorough an assessment survey from Aug. 7 – 17, 2017, to evaluate its performance standards and commitment to delivering safe, quality care in both its behavioral health facilities and long-term services and support programs statewide. During the nine-day review, more than 100 of Monarch’s sites were rigorously evaluated for compliance with healthcare standards related to care, treatment, and services; environment of care; leadership; and screening procedures for the early detection of imminent harm. Onsite observations and interviews also were conducted.The Joint Commission accredits more than 21,000 organizations worldwide and focuses on continually improving health care by setting the highest standards for health care quality throughout the world. Monarch President/CEO Dr. Peggy Terhune said of the accreditation: “Monarch is pleased to receive The Joint Commission Gold Seal of Approval®, the premier health care quality improvement and accrediting body in the nation. Monarch staff from across the organization continue to work together to develop and implement approaches and strategies that have the potential to improve care for people in our communities.” On Dec. 29, Monarch opened North Carolina’s first Youth Crisis Center, located at 1810 Back Creek Dr. in Charlotte, to offer help and hope to the families of the tens of thousands of young people, ages 6-17, who are in crisis and need of urgent mental health care around the clock in Mecklenburg and surrounding counties. The member-funded State Employees’ Credit Union (SECU) Foundation provided a very generous one-time grant also joined Monarch and other partners to help address the mental health needs of youth and adolescents in the Charlotte area with the opening of this 16-bed facility. Until now, children in this region facing a mental health crisis have been sent as far as 250 miles from the Charlotte area for similar services, and distances like these too often impede crucial family support and involvement in treatment. In July, Monarch assumed Assertive Community Treatment Team (ACTT) services previously offered by Amara Wellness in Charlotte. ACTT is one of the most well-established, evidenced-based practices in the Behavioral Health industry. This acquisition creates Monarch’s second ACTT in Mecklenburg. In late September, The Department of Health and Human Services’ Substance Abuse and Mental Health Services Administration (SAMHSA) announced it had awarded Monarch a $1.6 million grant to provide Stanly County vital, expanded services for people with serious mental illness and substance use disorders through the Certified Community Behavioral Health Clinic (CCBHC) model. Over the next two years Monarch estimates it will serve over 2,000 adults and children with serious mental illness, emotional disturbance, long-term chronic addiction, mild or moderate mental illness and substance use disorders, as well as complex health conditions. The expanded services will be offered at Monarch’s current behavioral health outpatient office at 350 Pee Dee Ave., Albemarle. The CCBHC model is part of the National Excellence in Mental Health and Addiction Treatment Expansion Act. This legislation expands the number of CCBHCs to increase access to community mental health and substance use treatment services while improving Medicaid reimbursement. CCBHC key goals include mental health and addiction treatment access; opioid crisis service expansion; primary care health screenings; expanded behavioral health support for veterans; and collaboration among community care partners. The Excellence in Mental Health Act initially offered funding to support CCBHC services to a limited number of states, excluding North Carolina. The SAMHSA grant will offer continued support of Monarch’s CCBHC effort with the possibility of an additional award of $1.5 million for the program’s second year, and the project is 100 percent federally funded. 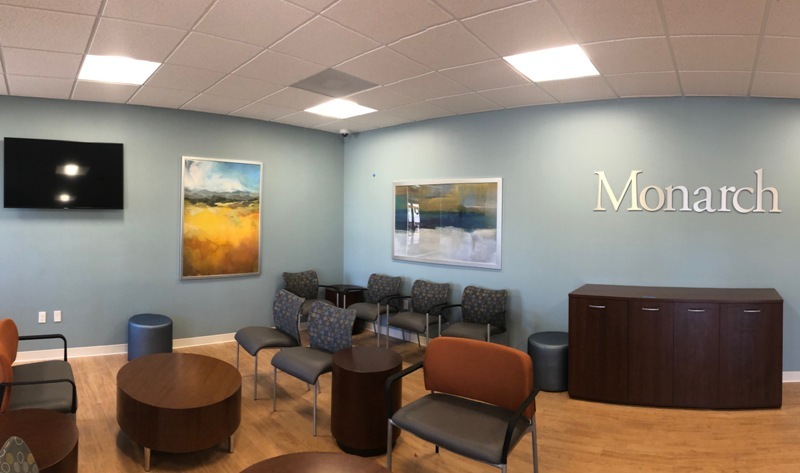 On March 25, Monarch opened a Behavioral Health Urgent Care on Chapanoke Road in Raleigh to meet the mental health and substance use disorder crises needs of Wake County. With support from Alliance Health, the area’s managed care organization, and Wake County, the program offers same day, walk-in service for ages 4 and older.